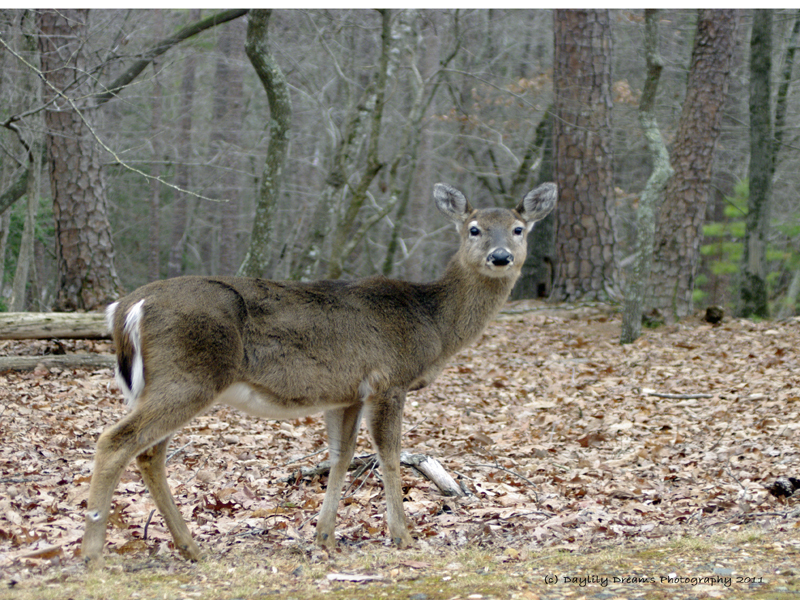 Another example of how tame and curious the local deer population is. 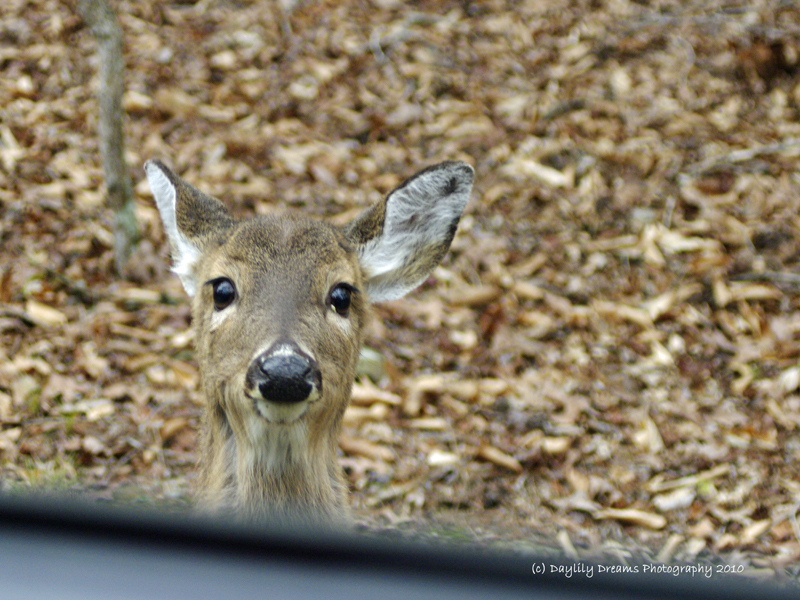 I was able to take pictures from my car while the deer seemed to pose. 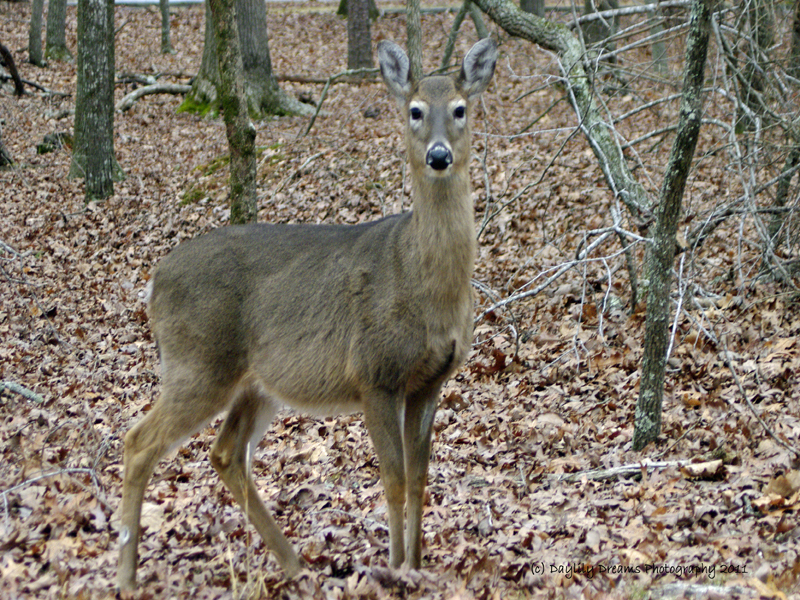 During my first trip to Morrow Mountain State Park, I was amazed at how calm and unfazed the deer were when they crossed the road and stood in the woods watching me as I watched them. Enjoy the gifts of nature surrounded by the remnants of a once mighty range of peaks. Upon first encounter, the Uwharrie Mountains may seem like a mountainous mirage. These steep, rugged hills?unusual topography for the area?form a stark contrast with the rolling countryside of the piedmont plateau. 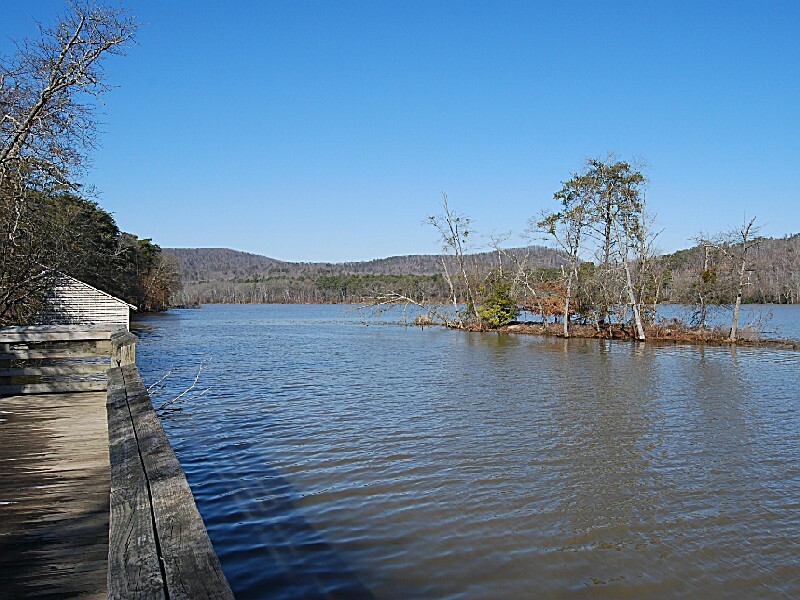 Recreation is plentiful in and around the waters of Lake Tillery and the Pee Dee River. Fishing, boating and swimming are popular pastimes. Nature lovers can pick from miles of trails to travel on foot or horseback. And for those who want to stay and take it all in, cabins and camping are available. There's really only one word to describe Morrow Mountain State Park: variety. Use the family car or RV, horseback or canoe, put on a pair of hiking boots or dip bare feet in the river, or bait your favorite fishing pole?a visit to Morrow Mountain lets you choose your kind of adventure. Rangers hold regularly scheduled educational and interpretive programs about Morrow Mountain State Park. 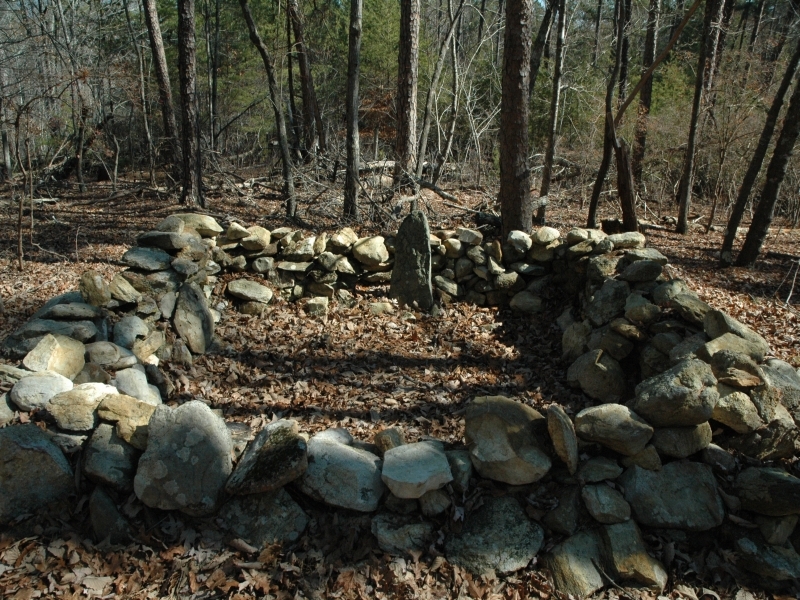 Early development of park property was a cooperative effort between state and federal governments. Work crews of the Civilian Conservation Corps and the Work Projects Administration constructed many of the facilities from 1937 to 1942. Additional facilities were added with state funds in the 1950s and 1960s. Today, the park covers 4,742 acres. Vacation cabins: Six rustic family vacation cabins offer the opportunity to get away from it all. Located in a wooded section of the park, each cabin has a bathroom, living room, fireplace, kitchen with dining space and two bedrooms. The fully-equipped cabins accommodate up to six people each. One cabin is fully accessible. During the summer months, cabins must be rented by the week; during the spring and fall, weekend rentals are accepted for a minimum of two nights. For reservations and fee information, contact the park office. Pets are not allowed in the cabins. Click here to download the cabin reservation form and additional information as a PDF file. Click here to download a cabin reservation form and additional information as an HTML document. Family camping: Choose from 106 campsites for tents and RVs. Each site in the family campground is equipped with a picnic table and grill. Drinking water and modern restrooms with showers are conveniently located. There are no hookups for RVs, but a dump station is provided. Camp Loop C offers six accessible campsites and a fully accessible shower house. Campsites are available on a first-come basis and a modest fee is charged for each site. A maximum of six people are allowed to stay on each campsite. An amphitheater, where interpretive programs are often held, is located near the campground. Primitive camping: Backpack into the woods for camping in a wilderness setting. The primitive campground is a two-mile hike from the park office. A pit toilet is provided in the camping area, but drinking water and all other supplies must be carried to the site. Fires are not permitted. A backpack camping permit is required and may be obtained from park staff. All trash must be packed out. Click here to learn more about backpack camping regulations and to download a backpack camping application. Group camping: The group tent camping area is located near the river and can be reached by a gravel loop road. Six sites, each with picnic tables and a fire circle and grill, provide a wilderness camping experience for organized groups. Drinking water and an accessible shower house are centrally located. Campsite #4 is fully accessible. Reservations are required for use of the area and a modest fee is charged. Click here for more information about group camping and for the campsite rules. Click here for the group camping reservation form. 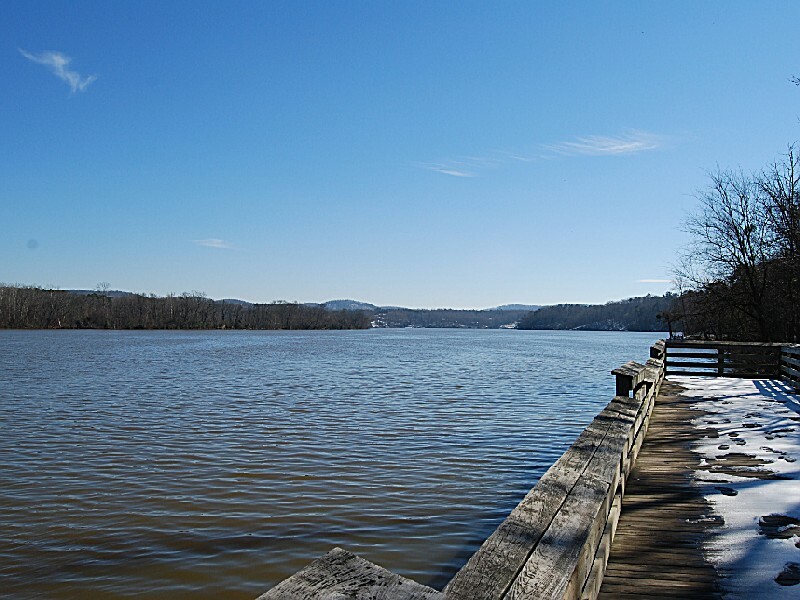 For those without boats, a paved parking lot to the left of the launch by the boathouse provides a base from which to enjoy the surrounding facilities. Rowboats and canoes may be rented at the boathouse located at the end of the parking area. Available daily from June through Labor Day and weekends in April, May, September and October, small vessels are the perfect mode of transportation on the tranquil waters of the Pee Dee River and Lake Tillery. 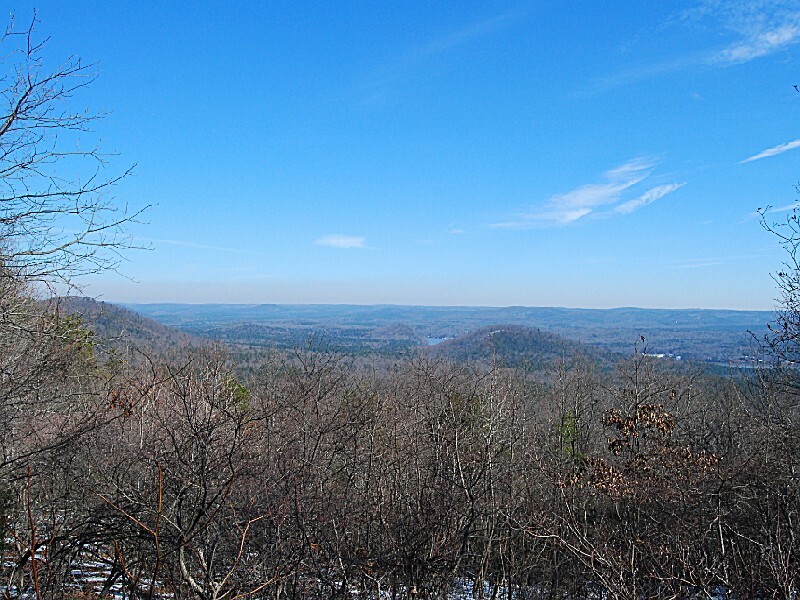 Have lunch on the summit of Morrow Mountain where one of the park's two picnic areas is located. A small, four-table shelter with a wonderful panoramic view of Lake Tillery and the Uwharrie Mountains is available, and restrooms are nearby. Single tables and multiple tables, along with grills, are available in both picnic areas. Picnic shelters may be reserved for a fee on a daily basis. Shelters are available on a first-come, first-served basis when they are not reserved. Contact the park office for more information or to request a reservation form. 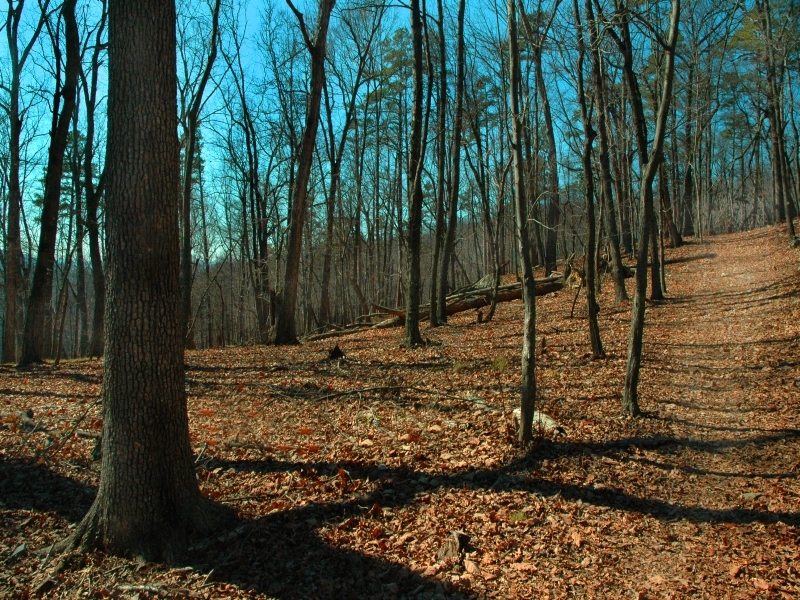 Explore the history of Morrow Mountain. The park offers an exhibit hall and a historical site. The exhibit hall is located in a building near the park office and is open from 10 a.m. until 5 p.m. daily. The hall includes exhibits about Native Americans, plant and animal communities, early explorers, and rocks and minerals. Visit the homestead of a 19th-century doctor, Dr. Francis Kron, the first physician in the area. His home, doctor's office and infirmary, and greenhouse were reconstructed in the 1960s and appear today much as they did in 1870. The grounds are open during park hours and are a short drive from the park office. We have been visiting this park for almost 30 years. For the past 5 years we have taken our grandsons and booked cabin #2. The wildlife and hiking is wonderful. Look forward to this trip every year. WONDERFUL!! Morrow Mtn. has always been my favorite. My parents took me there as a child to go swimming in the pool, and it was cold. very refreshing. Now I ride my motocycle to the park every chance I get. Only a hour and 15 minutes from home. Nice ride through Badin Lake area. Morrow mtn views are spectacular and alot closer than my other favorite place Blue Ridge Parkway. Happy 75 th BPW. This wonderful park has all that any outdoor person could ask for. Great gentle or strenuous trails for hiking, beautiful scenery, wildflowers, laurels, river views, old homesteads, but most of all, a very wonderful, helpful staff. From US 74 in Rockingham, take US 220 North (I-73/I-74. Turn left on NC 24, traveling west toward Albemarle. About six miles from Albemarle, turn right on Valley Drive and travel approximately three miles. Turn right on Morrow Mountain Road, which leads into the park. From I-85 near High Point, take NC 109 south, veering right on NC 109/NC24/NC 27 in Troy. Take NC 24 west toward Albemarle. About six miles from Albemarle, turn right on Valley Drive and travel approximately three miles. Turn right on Morrow Mountain Road, which leads into the park.